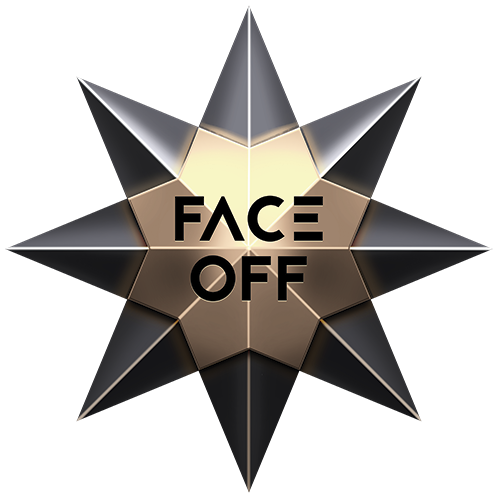 Face Off is a deck management game of fast paced violence and long term strategy set in a future where one individual's insane experiment has led to a vast arena filled with the greatest warriors, and sometimes misfits, of the universe. In Face Off each player leads a faction from throughout the multiverse in an attempt to collect treasures and conquer enemy headquarters to prove their might and gain their freedom. Each time a Face Off is decided the victor can choose to take a treasure, upgrade their deck, or acquire a victory point, the currency of Face Off. Each time a Headquarters is cracked (destroyed) a high value treasure, global effect, or victory point is acquired. Once all Headquarters have cracked the game ends and the faction with the most victory points can buy their way to freedom! Each faction in the game has a completely unique set of cards and mechanics to draw upon for victory. Play style and game focus will depend heavily on the faction chosen, but no faction is “best”. With a streamlined pool of 12 starting cards and a 5 card hand, fast turnover and card throughput is a staple of Face Off. A unique scoring system mitigates complete blowouts and maintains tension until the final battle, insuring that each Face Off and HQ is of utmost importance.